This is our second season of membership in the boating club Turun Navigaatioseura. The club has two skerry harbours in the archipelago available for member use. 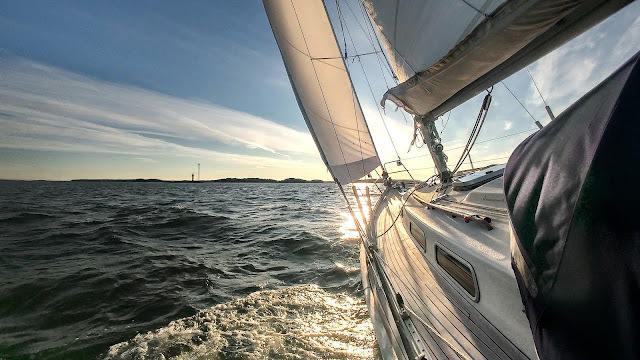 However, last season we did not have time to visit these two islands, so this season we decided to correct this and first make a one night trip to Östra Långgrundet. 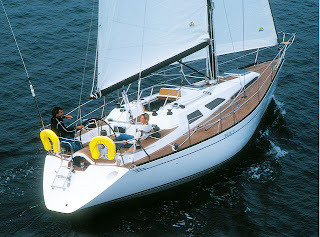 The island is located just about 20 nm from Turku, so its location is very good for shorter sailing trips. Östra Långgrundet is a beautiful island with good views to southern Airisto. We were the only boat staying there on Sunday evening. There is a pier and three buoys for visiting boats. And of course a sauna (what else could one expect from a Finnish harbour). Thanks for these photos and story! I'm also a member of that club, but haven't visited yet those harbours. It will be on our to-do list next summer, when we get our own boat. Looks lovely, lovely, lovely! I have to keep this in mind if we ever move to Turku!